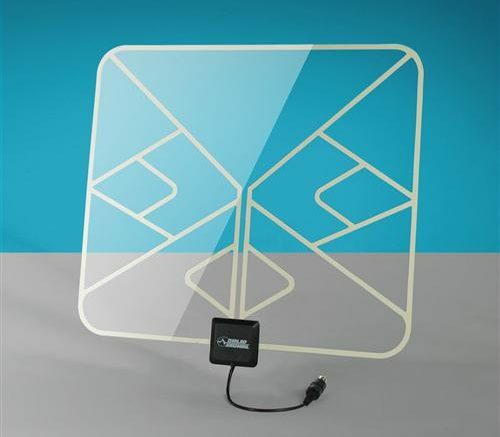 How can a flat antenna work as well as a regular one? Our HD-BLADE antenna is incredibly powerful, especially when you think about how it’s no thicker than a piece of cardboard. It seems impossible that something so thin can be so powerful, especially when we went through the 20th century with giant antennas that took up a large portion of your roofline. The answer is actually pretty simple: there are really two things that determine how well an antenna will perform. One is how well the elements are “tuned” the frequencies you want to use. The best antennas will have a mix of long and short elements to capture all the VHF frequencies, as well as a bowtie or loop type element to capture the UHF ones. Looking at the HD-BLADE, it seems we do pretty well on that. The other thing that’s required for a good antenna is its thickness when it’s pointed at the towers. When you put your HD-BLADE on the wall, the face that’s pointed to the towers is pretty thick — those elements are about 1/2″ tall or more. That’s thicker than old-school rabbit ears. See, it doesn’t matter at all that the elements aren’t thick from front to back… not at all. All that matters is the thickness when facing the towers. If you have a traditional antenna and you want a 1/2″ piece of metal facing the tower, it also has to be 1/2″ thick everywhere, sometimes even thicker so it can stand up. HD-BLADE antennas are encased in protective plastic which helps them stand up, and are easily mounted on a wall for even more support. They don’t need to be strong enough to stand up to wind like a larger outdoor antenna. That’s another reason our HD-BLADE can be so thin. There’s another piece to this puzzle as well. Most antennas are made of aluminum or steel. Every material is different in the way it conducts electricity, and while aluminum is pretty good, silver is the best hands down. HD-BLADE antennas use a micro-thin layer of silver rather than aluminum and this means that you’ll get the best possible performance. Laminating the silver in plastic doesn’t make it less conductive but it does add strength.